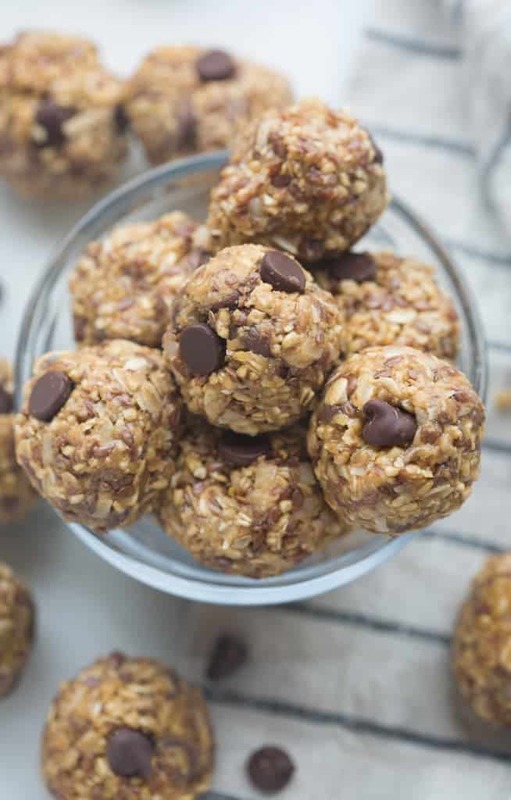 Oatmeal Peanut Butter Energy Bites are the perfect healthy, grab-and-go snack for a busy day! 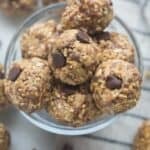 Bite size, energy-rich snacks like these Oatmeal Peanut Butter Energy Bites are my favorite! They are incredibly easy to make, and use ingredients you probably have in your pantry. Plus they’re completely adaptable. Have fun substituting your favorite ingredients! I’ll often include chopped almonds or substitute raisins or craisins for the chocolate chips. I recently used butterscotch chips in place of chocolate and those were delicious too! The options are endless. You can also substitute a different type of nut butter in place of the peanut butter. If you have a child with nut allergies you could use sunflower butter. They contain both rolled oats and steel cut oats, which add a fun crunch and an extra dose of healthy grains full of fiber and protein. The flax seeds are a great source of omega-3, protein and fiber, and the nutter butter is full of great protein and fiber too. All together this is a great, energy-rich snack. Another reason I love these is that once you make a big batch they will store well in the fridge for weeks! The perfect snack before a workout or for a busy morning when you don’t have time to make breakfast and forget to eat (story of my life)! 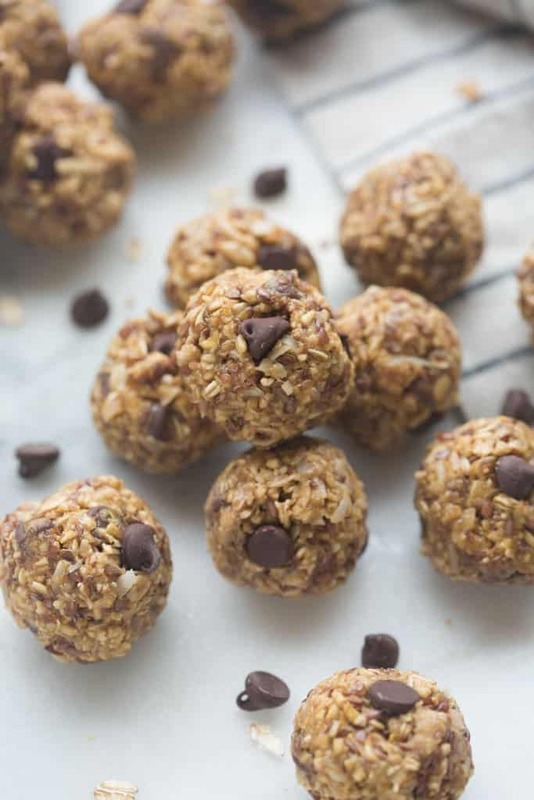 Don’t miss these HEALTHY SNACK IDEAS! 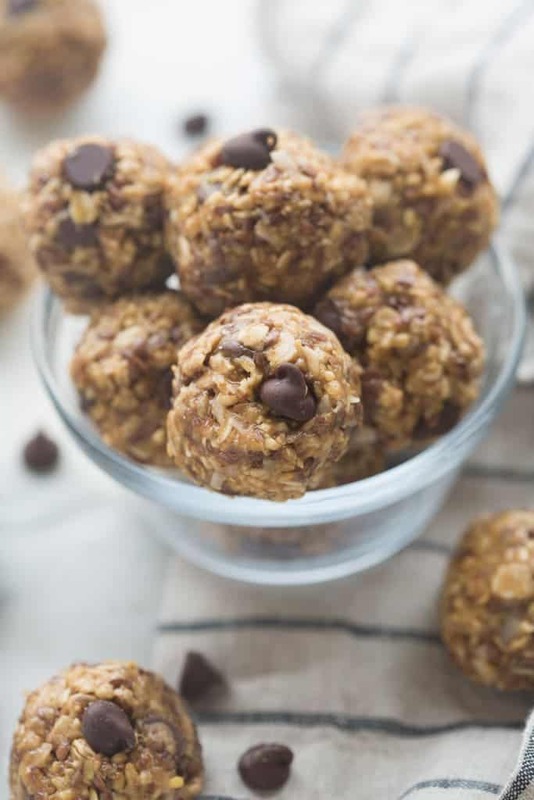 Oatmeal Peanut Butter Energy Bites with steel cut oats and flax seeds are the perfect healthy, grab-and-go snack for a busy day! Refrigerate for at least 1 hour before forming into 1-2 inch balls. (If the mixture isn't holding together well enough you can add a little more nut butter or honey to help it bind). Keep refrigerated for an easy snack on the go. Feel free to include other "add-ins" like chopped almonds, raisins, etc. Don't miss these HEALTHY SNACK IDEAS! If I don’t have steel cut oats can you just use double regular old fashioned oats?? You could, you will just want to adjust the amount that you add. You want the mixture to be a little wet/sticky but workable to form into balls. I have three very picky little kids and they had so much fun making and eating these! Thanks for the perfect snack idea.